Chapter 1: Understanding Relational Databases. Chapter 2: Modeling a System. Chapter 3: Getting to Know SQL. Chapter 4: SQL and the Relational Model. Chapter 5: Knowing the Major Components of SQL. 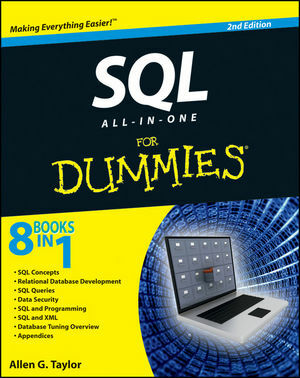 Chapter 6: Drilling Down to the SQL Nitty-Gritty. Book II: Relational Database Development. Chapter 1: System Development Overview. Chapter 2: Building a Database Model. Chapter 3: Balancing Performance and Correctness. Chapter 4: Creating a Database with SQL. Chapter 1: Values, Variables, Functions, and Expressions. Chapter 2: SELECT Statements and Modifying Clauses. Chapter 3: Querying Multiple Tables with Subqueries. Chapter 4: Querying Multiple Tables with Relational Operators. Chapter 1: Protecting Against Hardware Failure and External Threats. Chapter 2: Protecting Against User Errors and Conflicts. Chapter 3: Assigning Access Privileges. Book V: SQL and Programming. Chapter 1: Database Development Environments. Chapter 2: Interfacing SQL to a Procedural Language. Chapter 3: Using SQL in an Application Program. Chapter 4: Designing a Sample Application. Chapter 5: Building an Application. Chapter 6: Understanding SQL's Procedural Capabilities. Chapter 7: Connecting SQL to a Remote Database. Book VI: SQL and XML. Chapter 1: Using XML with SQL. Chapter 2: Storing XML Data in SQL Tables. Chapter 3: Retrieving Data from XML Documents. Book VII: Database Tuning Overview. Chapter 1: Tuning the Database. Chapter 2: Tuning the Environment. Chapter 3: Finding and Eliminating Bottlenecks. Appendix A: SQL:2008 Reserved Words.